The 18th Benelux Congress of Zoology took place between 2nd and 4th November 2011 at Utrecht University in the Netherlands and was organised by the Royal Dutch Zoological Society (Koninklijke Nederlandse Dierkundige Vereniging - KNDV). 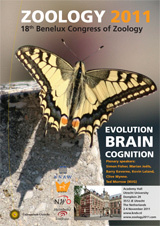 The meeting was organised on the theme "Evolution - Brain - Cognition". As the meeting has now taken place, this website is no longer being updated, however the pages will be left up for information purposes. The final scientific programme can be viewed here. Abstract submission and registration are now closed. © Will Swaney. All rights reserved. Original design by NodeThirtyThree.